In stock pocket-sized, die-cast Take-n-Play Storybook Car from Fisher-Price. 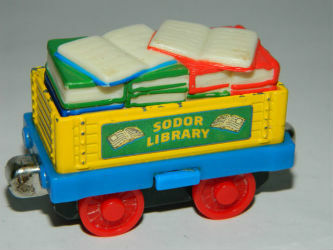 This durable little die-cast cargo car which is special because it features books, this is a great toy for reminding children of the importance of reading stories and visiting the library!! Take-n-Play Storybook Car will make a fine addition to your Thomas the train collection, Order today!